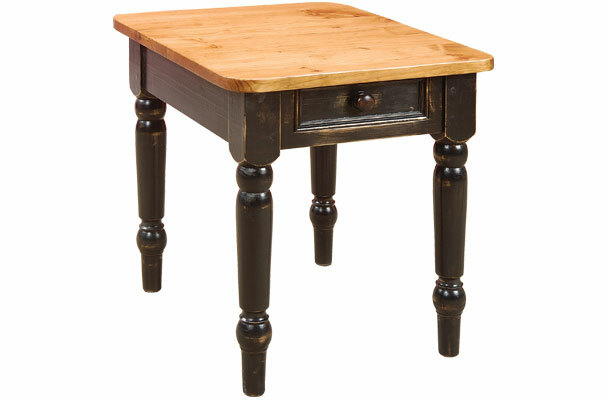 The Turned Leg End Table melds European elegance with cottage-style. 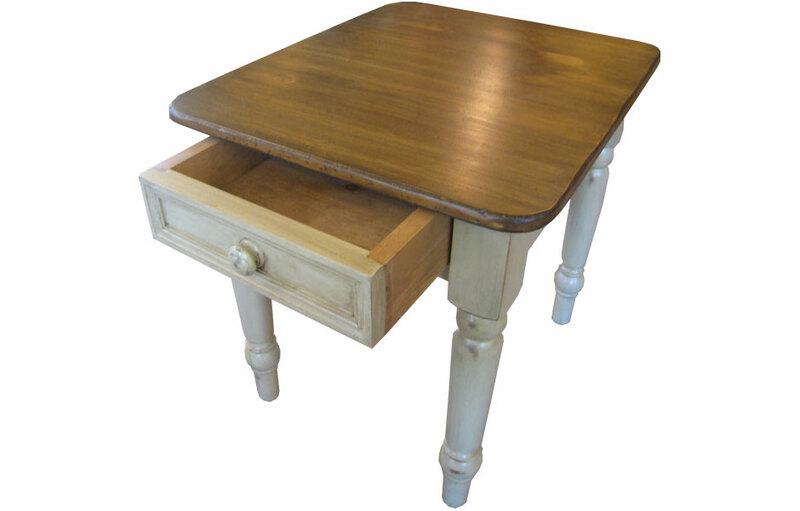 It has four turned legs with charming ball turnings and one drawer with a wood knob. The drawer face has a mitered flat panel design. The legs are 3" wide and are joined to the skirt with mortise and tenon joints. Perfect for use as an end table or bedroom nightstand. 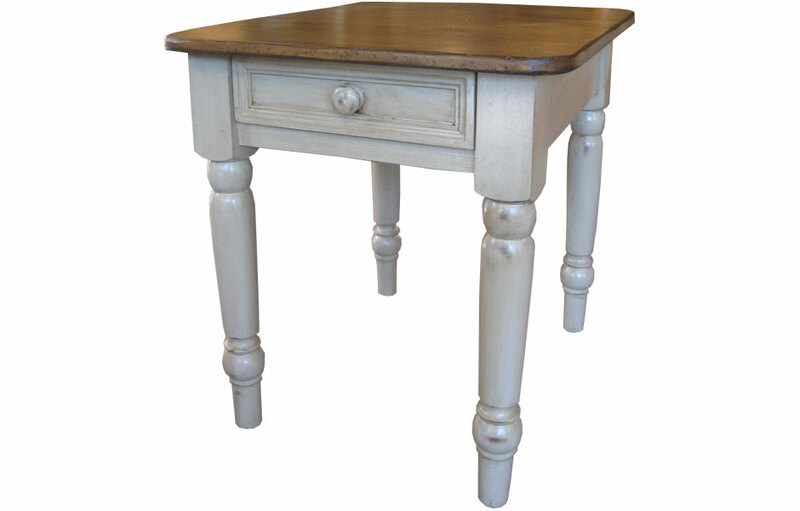 The Bella Turned Leg End Table melds European elegance with a touch of cottage-style. The classic, solid wood occasional table features turned legs and one drawer for storage. The small table makes a perfect nightstand or end table in a living room. The sturdy, hardwood turned legs are mortise and tenon to the skirt to stand up to years of use. The one drawer provides storage for a remote, tablets, and other essential items. The drawer face has a mitered flat panel design. The occasional table is punctuated with a classic wood knob. The table hardwood legs are 3" wide. The 26" depth makes it the perfect size for lamp, clock and accessories on the top of the end table. The 25" height is just right for beside a bed or a sofa. The top of the end table is water-sealed to prevent water rings, and for everyday use. 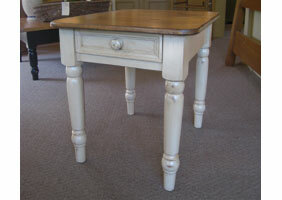 The country French end table with a drawer can be painted in a classic two-tone finish with a stained top and painted base, or all-over one color finish. The Bella Turned Leg End Table complements French Country, English Cottage, Farmhouse, Rustic, Transitional and Traditional style decors. Turned Leg End Table finished in Millstone. 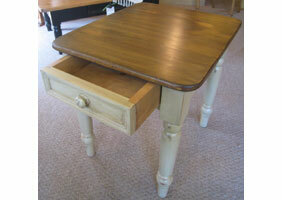 Turned Leg End Table with open drawer.